Has John done the run yet does anyone know ??? Pawprints for ever on the Rainbow Bridge, the gateway to your heart. We will wait for you there. or shorter version...............Pawprints in your heart until we meet again on the Rainbow Bridge. How many words can it take? How many squares are there left? Wow Tan very generous of you I think there are still a couple of squares left and the free "Childs" squares in anyone is interested and want to support John. Buying 16 squares now. Will send you the funds bank transfer and email pics. Due to the shape of the running shirt (rounded collar) there will be a 3 inch gap running across it. Please type your ideas in this thread or on cat chat. 40 square left. can we fill the whole shirt as a tribute to our furry friends? email me at jontaylor93(at)aol.com if you want your cats photo and a message to him/her on the running shirt. Hiya Jon A warm to Purrs to ya. What a fantastic thing you are doing to help Farplace rescue and a wonderful idea to put the cats on your t shirt. Bloomin well done sir! We would be proud to support you. Will pop your run on the news flash page for a while to help spread the word to memebrs and public. I really hope you do well and reach the 100 target. And pop an email to purrs@purrsinourherats to notify us of any donationmade and to obtain a receipt. Or donations by way of the Shop donations item, where you can pay by cheque, paypal account or credit or debit card through paypal's secure pages. Just off to pop your run on the news flash and will get some sqaures for my two lads. that photo size will be perfect. at the moment im basing the square size on the assumption that all 100 squares get taken. the printing area on the front of my running shirt measure 50cm long by 30cm wide. I have divided this into 50 squares measuring 5cm up by 6cm across. the printing are on the back is the same. this gives me 100 squares. i have reserved 10 squares for children who have lost their cats. they are getting their photos squares for free (i am paying their donations). Also, what size do the squares equal on the shirt? jpegs can be any size really. I will re-size all the photos anyhow to fit in the squares. (Also, some people have requested to have more than one square so that their photo can be bigger on the shirt). What size do the jpegs need to be please? I have alerted Tan (She's in charge of the site and donations etc) to your thread and question about donating to Purrs. So I'm sure she will get back to you ASAP. Hi Jon, welcome to the site. I've seen you on CatChat too - Sam looked to be a very loved lad. Good to see you on Purrs, hope you stick around and will try and donate £2 ASAP. thanks for your support. doing this is my way of keeping going. also, without the people on here i think I would have cracked up with Sam's loss. Hi Jon and welcome to Purrs. I think what you are doing is wonderful and I will try to send you a photo (maybe 2 if you have space on your T shirt) at the weekend. My boss has phoned me to ask how I am doing with the sponsorship, and I mentioned to him about this website. He has made a offer to donate some money to Purrs. Basically for every one who takes up a £2 square on my shirt he will donate £1 to purrs. This is quite generous of him as he is already giving £2 per square to Farplace Animal Rescue. So if I can get the shirt covered (all 100 squares) then Farplace will receive £200 and Purrs £100. Please note : could someone at Purrs please email me at jontaylor9[at]aol.com with details on the best way for my boss to send you some money. Ive just spent the last hour reading through threads on purrs and i agree it is a great site. I can see myself spending many hours on here. ive only got a handful of people signed up to have their cat photos & message printed on my running shirt. if theres anything you can do to put the word around I would be grateful. I am hoping to fill the shirt with our cat photos. (if there's any young kids who want their cat photos on the shirt and they cant afford the sponsor money then I am willing to pay their bit myself). CatChat is the spiritual home for a lot of the Purrs members ... Purrs was created as a direct result of CatChat closing it's forum hence why we have such close links with them. CatChat is now aimed more towards helping people with their feline health issues and of the course the very important work of rehoming kitties. 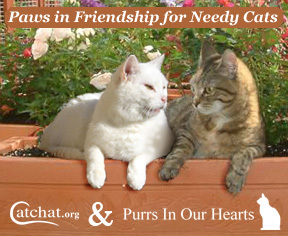 Whereas Purrs has sections to chat about so many different things (not just cat) I hope you decide to remain a regular visitor here as, like CatChat, it is an incredibly friendly forum which does wonderful work in raising funds for UK Cat rescues. I dont know what i would have done without having catchat in the days when my Sammy was very ill. And the support I got from people when he passed on was just amazing. I thank my lucky stars for the people ive met. If anyone perfers to post £2 to me, then feel free to email me for postal details at the same email address. Many thanks, your help is really appreciated. I want to make sure to people that I will send a digital photo of their part of the runnign shirt to them. Then they can think of their cat when the Great North Run is live on tv. They have a great dog and cat rescue facility. I was drawn to them because (1) of their work with cats, (2) because they were able to provide me with a guarenteed place in the Great North Run and (3) because they are relatively local to me. Hopefully their site will be up and running soon. Also, if you want to contact them to confirm my place in the run etc, then that is ok with me. no, thats the bank account to pay for the photos & messages to be printed on the running shirt. for everyone that agree to donate £2 the company I work for will donate £2 to Farplace to be given in a cheque presentation (upto a total of £200). Have just looked at the web addy and the site is down, dont know how long. Can you tell us about the work they do there and what animals and facilities they have, please. Happy to help. Are those bank account details for Far Place? Im hoping that I can fill all 100 places on the shirt then my boss will donate the full £200 to Farplace. Anything you can help to put the word round will be appreciated (I dread only getting 3 or 4 people signing up). It only costs them £2 and I will send them a photo of their cats pic & message on the shirt. Those are my address details, I will edit the original post as you suggest. to Purrs, Jon. Yes I have seen you on CatChat! A word of caution: are those your bank account and other personal details? If so, I suggest we take them off the public forum and any members wishing to sponsor you can email you direct. Please will you put the web addy for this rescue on this thread please. (Some of you may know me from catchat forum, here are the details of a charity run i am doing and how you can help). Gareth will confirm to you that I am one of their confirmed runners in this years Bupa Great North Run on 5th October 2008. Modified to disguise Jons personal details.